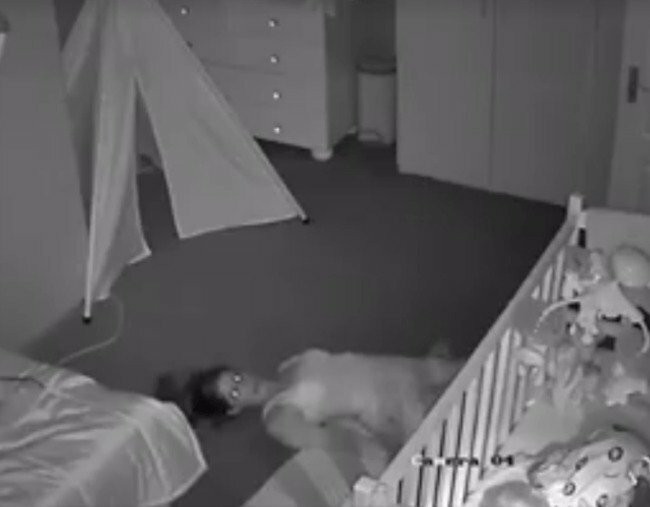 How to not wake your baby: this mum gives a hilarious masterclass. The parenting video people without kids just don't understand. Anyone who has a child or has babysat a child knows getting them to sleep can be a big production. A production that doesn’t end once the kid is asleep. Because that’s when the real song and dance number begins, stealthily getting out of the room without waking them up. South African mum, Caryn Chelin Morris, understands that challenge and found a creative way of getting out of the room without waking her son up. The best thing about having cameras in your house is watching your wife trying to exit the room after putting your son down!! Sometimes you have to use your initiative for your exit!! PS The SA Army are calling me for you to do training on the reverse leopard crawl !! After putting her son in his crib, Caryn lies down on her back on the floor and sort of snake-slithers out of the room. With the night vision camera you can see her eyes are on her son in his crib the entire time, watching to make sure he doesn’t notice she’s leaving. Thankfully, she makes it out of the room with the baby still asleep. A victory parents around the world are cheering. Basically, Caryn is inspiring parents around the world to give the snake slither a try in their own homes. As one mum put it, “I see this in my future”. We ask mums the real questions when it comes to getting your baby to sleep. The Mummy Bloggers: Why women should never stop sharing the reality of their lives online.